Astrodon 6 nm FWHM H-a and OIII filters and E-Series RGB filters. Unbinned at a plate scale of 0.59"/pixel. Measured seeing in 15 min. guided exposures 1.4-1.7". The field-of-view is approximately 10x10 arcminutes and north is toward the 4 o’clock position. 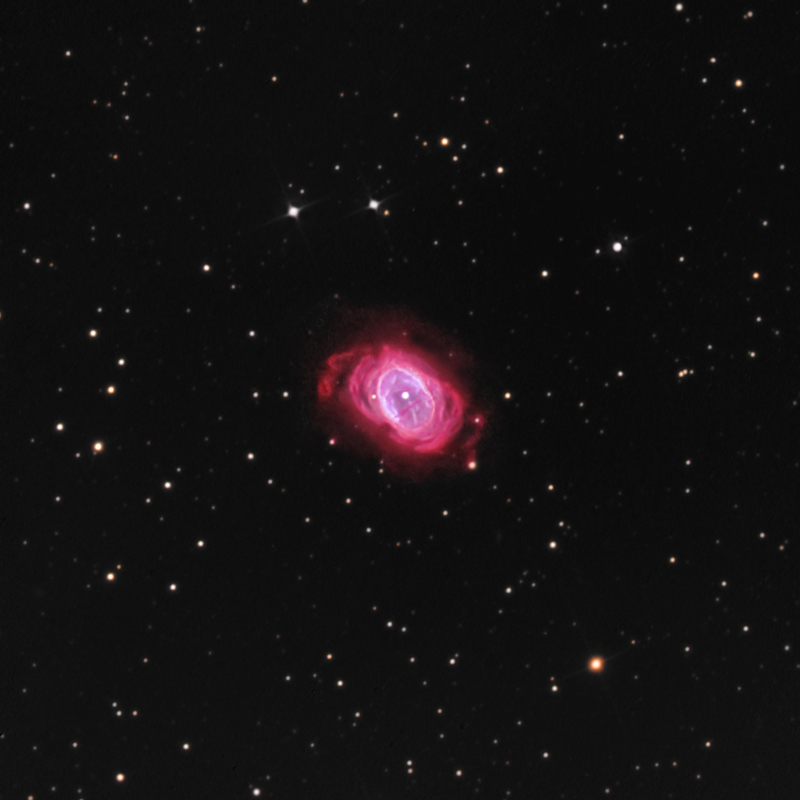 The Southern Ring Galaxy (NGC3132), like its more familiar northern counterpart (M57), is a small oval-shaped planetary nebula. It is the result of a star becoming a red giant, an asymptotic red giant, expelling its outer atmosphere is mulitple events through circumstellar dust and eventually becoming a very bright, very small white dwarf. That star is easily seen in M57. However, the central bright star in our image is NOT the proginator star, but rather a brighjt star in the line of site to the nebula. The proginator star in the above image is about a half-diameter of this bright star toward the 8 o’clock position. It can be seen in the classic narrowband Hubble Space Telescope image of NGC3132 shown below, but we do not have the resolution to detect it here. The dust lane crossing the short axis of the core shown so well in the HST image is also seen above. In particular, we present several halos surrounding the core even beyond what is show in the HST image (NASA, Hubble Heritage Foundation).